This angle of the ER building at Hazel Hawkins Hospital always intrigues me. Anyone else get reminded of science fiction movies of the future? Notice the orange windsock. Helicopters land up there on the roof. I don't think they land on the round overhang, but sometimes I wonder. 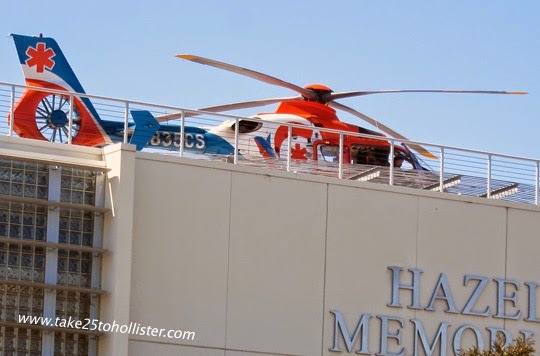 Being that our community is in a somewhat remote location, I am glad the hospital has a heliport. 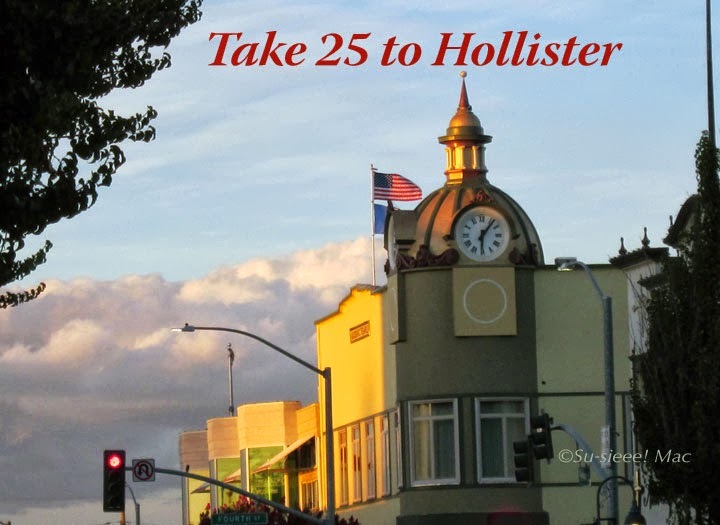 It's GET RED month in Hollister. Go ahead, take the time to ponder: Get red? Get angry...get commies...get those red-headed guys...get Red Skelton...anymore? Seriously, February is American Heart Month, as in be kind to your heart and take very good care of it. So, to promote happy, healthy, heart awareness, the Hollister Downtown Association got together with the YMCA and the Hazel Hawkins Hospital to sponsor various events. 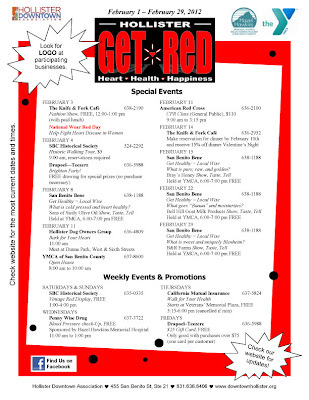 In addition to special happenings, some of the participating businesses are offering discounts on their products or services. 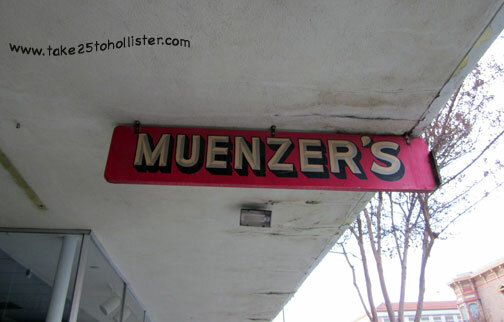 For example, Muenzer's has a 15% discount on all shoes in stock throughout the month. 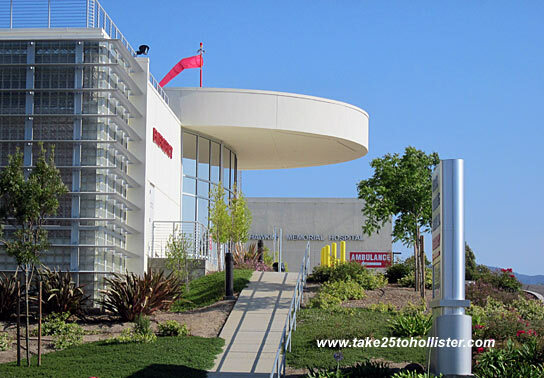 For a schedule of events and updates of business offers, check out this Hollister Downtown Association page. Here's a bit of good news for all you women who are self-pay patients: October is Breast Cancer Awareness Month. And, that means during this month of October, many medical facilities nationwide are offering mammogram screenings for $75 to self-pay patients. You read that right! In San Benito County, self-pay patients can get a mammogram at this special rate at the Hazel Hawkins Hospital Radiology Department. All you need is a physician's order to make an appointment. The phone number is 636-2650. If you don't have a physician, you can get the necessary breast exam and doctor's referral at one of the three community clinics in the county: Hollister Clinic, Hazel Hawkins Hospital Mabie Health Care Center, or San Juan Bautista Clinic. The cost for the exam is $25 if you pay at the time of your visit. 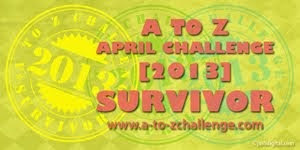 For addresses and phone numbers for the clinics, click here. There are only a few weeks left in October. So, go to it! The Radiology Department has extended evening and weekend hours. Please pass the message to all your friends and relatives who need to take advantage of this offer. For more information about Breast Cancer Awareness Month, click here.